Rich DeLucia recalled getting fidgety, so he went out and played tennis, he told his hometown Reading Eagle. This was June 1986 and the University of Tennessee student was waiting to see if he'd be drafted. By evening, he found out: The Mariners took him in the sixth round, The Eagle wrote. "It was a total feeling of relief," DeLucia told The Eagle. "I had finals to take in my last week at Tennessee, which would be hectic. But then I'd be doing what I always wanted to do - play professional baseball." DeLucia then didn't stop playing professional baseball for the next decade and a half. In 10 of those seasons, DeLucia pitched in the majors. By the time he was done, DeLucia had 320 major league appearances, 49 of them starts. He also had a career 4.32 ERA. 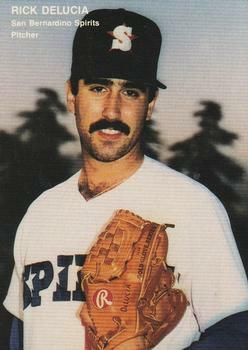 DeLucia's career began that year in 1986 with the Mariners selection of him out of Tennessee. DeLucia played his first season at short-season Bellingham. He didn't play in 1987, but returned for 1988 at single-A San Bernardino. He made AA Williamsport in 1989. In 1990, DeLucia played at four different levels. He played at high-A, AA, debuted at AAA and he also debuted in the majors. DeLucia debuted with the Mariners in September. He got five starts and had a 2.00 ERA. He then returned to Seattle for all of 1991, getting 31 starts. He went 12-13, with a 5.09 ERA. Going into 1992, DeLucia made the move from starting to middle-relief. He told The Associated Press he first thought it was essentially a demotion. But that view soon changed. "There aren't too many guys in the bullpen who can go three or four innings at a time and that's something I can do," DeLucia told The AP. "They know I can start if someone gets into trouble early, they know I can come in." DeLucia soon left starting behind for good. He stayed with the Mariners into 1993, when he moved to the Reds. He played 1995 with the Cardinals and 1996 with the Giants. He got into 56 games in each of his 1995 and 1996 campaigns. He had a 3.39 ERA with the Cardinals. He then played 1997 and 1998 with the Angels, getting into 61 games in his 1998 season. DeLucia's 1997 season included significant lost time due to an aneurysm found in his shoulder, according to The Los Angeles Times. He made it back briefly at the end of that year, then helped the Angels make a run at the playoffs in 1998. "That crushed me," DeLucia told The Times of his lost time in 1997. "That's why I'm taking it all in this year. This is what baseball is all about, to be in a pennant race in September." DeLucia played in just one more major league season, getting six outings with the Indians in 1999. He played his final professional game in 2001 at AAA with the Tigers.